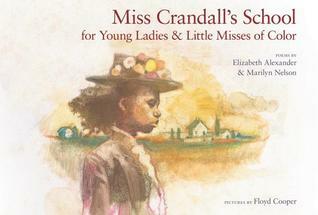 Poems by Elizabeth Alexander & Marilyn Nelson. Pictures by Floyd Cooper. In 1831 Prudence Crandall opened a boarding school for young ladies at the request of the people of the town of Canterbury Connecticut. As a Quaker, she saw no problem with inviting the African American maid of the school to take part in classes once her work was done. Soon after, the first African American student enrolled. Unfortunately, the white residents of Canterbury took exception to African American students learning with their daughters. By 1833 the white students had been withdrawn and an entirely African American student body enrolled. The people in this very white town in the most homogenous state in the nation were in an uproar. The poems in this beautiful book tell the story of this exceptional school, of its students, of their wish to better themselves and their communities, of the sacrifices they made to learn and of the trials they endured in a place where they were legally free but societally constrained. The poems in this book and the beautiful illustrations evoke these brave students, their wonder at the fears of the residents of Canterbury, their hunger for learning. All sonnets, they tell a tale of the sacrifice made to get the girls to school and the troubles they face when the town turns against them, fouling the well, and making laws in attempts to drive them away. I can see a myriad of uses for this book in the classroom. The story illuminates the tensions in the northeast in the mid-nineteenth century. It is easy to believe that all the racism and trouble in this period was in the south; however, Miss Crandall’s School clearly shows that tensions there between white and African American residents were very real and very dangerous. The poems all take the form of sonnets and could be studied simply as poems or for their form. The details of the story provide avenues for critical thinking. How would you do your laundry, exercise, plant potatoes if the only way to stay safe was to remain within the walls of the school? What case could the students build against new laws made to evict them from the town and the state? Can one group of people restrict the education of another?